Chocolate Hazelnut Butter + A Blendtec Giveaway!!! Oh, dear reader, I cannot begin to tell you how excited I am to share big news: I’m doing my first-ever giveaway!!! The good folks at Blendtec have been kind enough to offer a great package to one lucky reader. I’m honored to be part of Blendtec’s nut butter week. 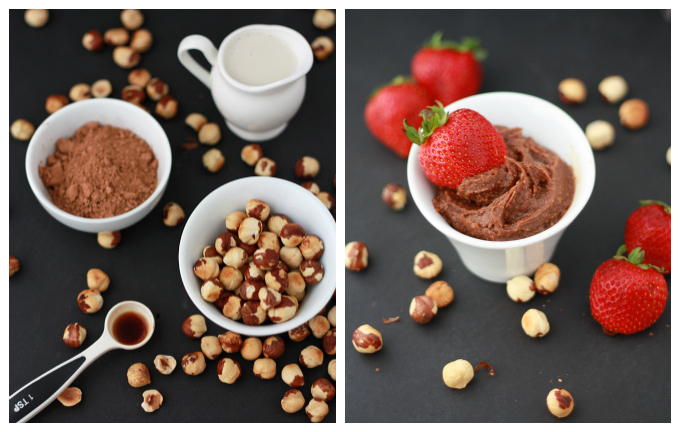 Today on the Blendtec blog, I’m sharing a recipe for homemade chocolate hazelnut butter. Please stop by, say hi, and don’t forget to enter my Blendtec giveaway below, open to all U.S. readers. Good luck, friends! I wish I could give you all one. Winner announced Monday! Blendtec Recipe book and owner’s guide. 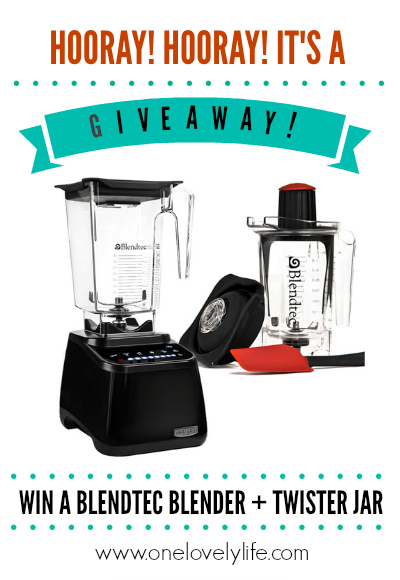 Disclosure: Blendtec provided me with a blender to review and is providing a blender for me to give away. I received no monetary compensation for these posts, and all opinions are my own. I would probably use it daily too, especially for smoothies in this hot summer! I have been desperately wanting one of these!!!!!! I can’t wait to check out the recipe! My husband and I often make a smoothie after we run together and our current blender STRUGGLES with it, ugh! So I would love to just push a button once to blend something!! I WOULD LOVE A BLENDTEC!!!! I’ve gotten to see one in action, and it blows every other kind of blender out of the water! I’m dying for a blendtec! I hope I win! I would LOVE to win this! I’ve been using a cheap blender to make my family smoothies for years, so we’d definitely use this to make smoothies the easy way! Thanks! I’ve heard they are the best blender to use for everything! I would make yummy smoothies in the mornings and I would love to try making soups with it too! I would love to make smoothies and soups with it. I would love to see what all if can do actually! Oh I would love a blendtec! As a mom and a teacher I’m always on the go…I would be able to make delicious, quick breakfast smoothies for me and my family! The blender we’ve had for 7 years is dying! We are looking for a new one, this would be awesome to win! I would love to try your avocado cilantro dressing — yummy and healthy! I could really use a blender…. Looooove your recipes (& photos!). Thanks for doing a giveaway! I am chewing my “smoothie” as we speak. It would be awesome to drink a smooth smoothie every morning. What a fun giveaway! I would love love love one of these! I’ve always wanted to try a soup. i’d send it to my Momma and let her #blendallthethings She’d totally love it! Would love to make this!! I would love to win this and make healthy smoothies for my girls! Oh I need this in my life! We make lots of smoothies and protein shakes and this would just work wonders for me. And I want to try to make soups with it. It seems too good to be true! I have been making my morning green smoothie with the blender I got 10 years ago for our wedding! Its definitely time for an upgrade!! How fun! Would love, love, love to have one! The first thing I’d make is an amazing batch of peanut butter smoothies. Yum! what wouldn’t I make?! I would love a new blender, mine is starting to sound funny when I throw frozen bananas in it :/ thanks! Pretty please with a strawberry on top!! We love smoothies around here but are pretty limited by our current $30 blender. I’d sneak in all the things with a Blendtec! Love you blog and recipes! A lot of meals we have on a regular basis come from here. Thanks for doing so many Paleo friendly recipes too! I would love this blender to whip up some yummy smoothies! I just found out I am pregnant so I would use this for baby food in the near future! What a fun giveaway! I’ve been wanting one of these blenders for a while…. We love smoothies at our house and this would be awesome to have! I think my blender is on the fritz, so I’d love to win one of these!! my first order of business would be to make a milkshake! after that i want to try smoothies, peanut butter and soups!! thanks for the awesome giveaway! Whenever I’ve gone to Emerald City Smoothie I’m always amazed how quickly things blend together. At home it’s never that easy for me. So awesome to see you’re doing a give away for making life healthier and easier. Thank you! Hope you’re having a great week! Happy almost Fall! I love watching You’ve Got Mail in the Fall too! What an amazing giveaway! I would make smoothies every morning and freeze leftovers for Popsicles. We love homemade Popsicles! I have the cheapest blender on the planet. This would be a huge game changer for me! What wouldn’t I make!!! Fingers crossed. I would love to use this for making green smoothies! This would be so exciting to win! Thank you. I need this in my life asap!!! I love this website and turn to it several times a week for food inspiration! I would love this for smoothies! This would be awesome for my daily protein smoothies. My dollar general blender isn’t cutting it. A bledtec. What a dream!!! I have been wanting one of these for forever so I can finally make smoothies! Emily, I don’t know if you remember me- I was really good friends with Michael his freshman year of college and we met a few times then. You should know since then I’ve followed your blog and pretty much turn to your recipe index anytime I need to make something I know will be delicious! Seriously, your blog is so great! You and Michael have the sweetest family. I was just saying I need a new blender–my $30 one isn’t doing that well! I would definitely be all over this hazelnut butter with a blendtec! Awesome giveaway! Such a great giveaway! I have been dying for a good quality blender! Would love to try some great fall soups with the Blendtec. Homemade salsa would be so easy with a blendtec! I’d make a gazpacho or some banana soft serve! Thanks for the awesome giveaway! I would make smoothies every day. I have been seriously coveting high powered blenders lately. Love this giveaway! A blendtec would help take my gluten free, dairy free cooking to a whole new level! I would make smoothies and protein shakes! I would LOVE LOVE to win! I would make a green smoothie first! I would make a great morning smoothie in it first. Blendtecs are even great to make salad dressings. It emulsifies the dressing perfectly with a lot less oil! One of my favorite Blenders and YouTube videos of all time! Will it blend???!!! It would get used for a lot of milkshakes in my house! I would love one of these! Such a great giveaway! I really want to make my own hummus, and you really need a machine to do that! I would make breakfast smoothies with a lot of strawberries and greens. Michael just reminded me to do this!!! Fingers crossed!!! Emily, I love your blog! What a fun giveaway. I think I found you years ago when I was reading blogs of friends cousins or something, haha! My husband would use this for Sunday Morning Smoothies 🙂 And I would use it for all sorts of things!! Smoothies, smoothies, and more smoothies!! I would love to make this spread. I also love to make smoothies! You have the best blog ever! What an awesome giveaway! I would love to make green smoothies and nut butters with a side of five fact Friday! Butters, smoothies, and ice cream these are thing I would make. Hi! I just love your blog! Your kids are adorable and I can totally relate to so many of your posts. And now a giveaway? Awesome. I would use that blender almost everyday. I love to sneak veggies into smoothies for my kids and my blender has been a real trooper, but is really starting to struggle. Thanks for the fun reading and the giveaway, too! I think if I won this, I would blend everything! I love your blog Emily! This poor college student would LOVE a new blender. Awesome giveaway! I have been loving all your smoothie recipes lately! I would love to use a blendtec for making baby food, soup, salsa, and smoothies! Ooo! My blender broke. I met Tom Dickson at Temple Square while serving my mission there and took him and a young admirer of his on a tour. What an amazing man trying to make everyone’s dreams come true! Since then, I’ve always wanted one. I would make almond butter, salad dressings and all good things gluten free. I would LOVE a BLENDTEC!! Smoothies, spreads, and dressings…oh my!! I would like to try making a potato based soup. Ive heard blendtec blenders have a soup button and i think that would be awesome! I’ve been wanting a Blendtec for so long! Especially now that I’m pregnant, great blenders make eating healthy that much easier. I would make smoothies and guacamole! LOVE following your site 🙂 and thank you for doing this giveaway!!! I’ve heard awesome things about Blendtec! Would love to have one of my own! I would LOVE, LOVE this!! 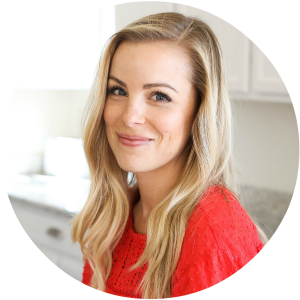 I have been following your blog for years, making your recipes, and it’s one of the happiest places on the internet! Breakfast smoothies to get lots of veggies in my diet! I would make everything I could but mostly green smoothies! I’d make smoothies first, then some salsa! Love you. Love your blog. Love Blendtec. I would like to make soups, smoothies, dairy free ice cream and sauces! !